I have a bonus or a promotion code. How can I use it? Click on the store tab, then type your bonus number or your promotional code (as shown below). Concerning to the CEFR (Common European Framework of Reference for Languages​​), we chose to work with the following levels for our program: Beginner, Elementary (A1-A2), Intermediate (B1-B2) and Advanced (C1-C2). These can be adapted to your profile and interests. The program continues to adapt to your progress throughout the course. Is it possible to change my level or language? 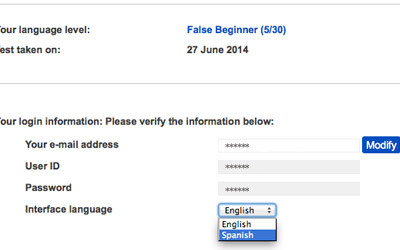 If you have selected the wrong language while making your order or if you want to change the level of your course, please contact us via the support form. To change the interface language of the platform, click on "My Account" and then change the language as shown in the image below. Please note that in order to allow a full immersion in the language of the course, the instructions of the exercises are in the targeted language. 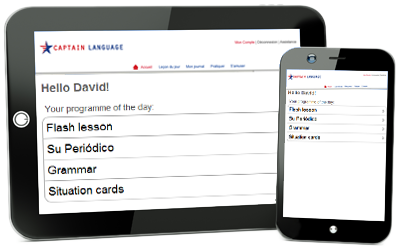 If you do not know certain words, try to use the dictionary and the translation tools available on the platform. Can I connect from my smartphone or tablet? 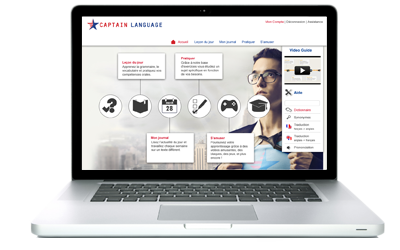 Some features of "Captain Language" require Flash Media Player that is not enabled on some devices such as the Ipad. That's why we have developed a special version for mobile devices that allows you to log in without problems from your smartphone or tablet, regardless the brand. To access this option, click on "Mobile Access". Can I buy two courses? For instance one French and one in English? 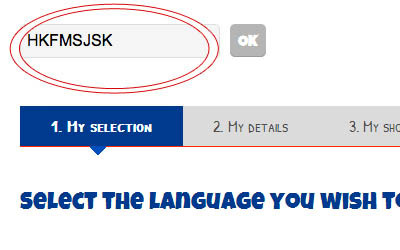 Definitely, we just have to subscribe two different codes (one for each language). Each course will be tailored to your level.